Dermocybe splendida has the common name of Splendid Red Skinhead, and is from family Cortinariaceae. Pronunciation is Dermo-sigh-be splendid-da. The Cortinariaceae group of fungi are typically recognised by the presence of a 'cortina'. The cortina is a veil of silky or cobwebby fibrous threads which protects the gills of a young mushroom. 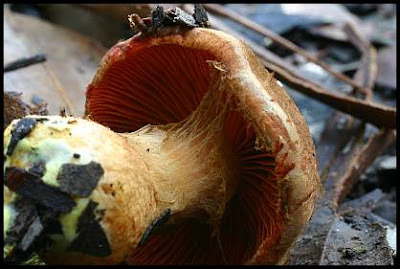 The veil collapses as the cap opens in most cases, often leaving hairs on the stem which then stain brown from the spores. In the image below, the fibrous veil has been stretched as the cap expands. And in the image below this, the cobwebby strands have almost completely separated from the cap. This attractive fungus grows in soil in Eucalyptus and Leptospermum (tea-tree) forests in eastern NSW, Victoria, Tasmania, south-eastern SA, and south-western WA. 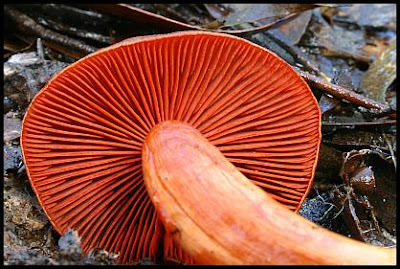 Orange-red caps are initially convex (domed), expanding up to 90mm into a broadly umbonate red-brown cap. An 'umbo' is a dome-like swelling in the centre of the cap. A slight umbo can be seen in the fungus on the right of the first photograph. The cap is dry and smooth. 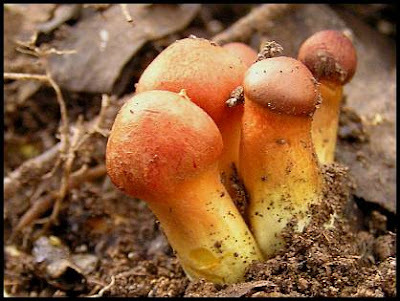 This fungus can be found singly, or in small or large groups. 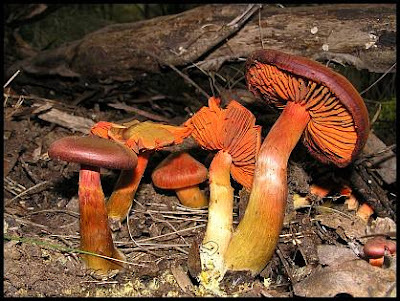 The stem can reach 130mm in height, tapering upwards, and can be bulbous at the base. The tapering of the stalk is evident in the following image, and a bulbous base can be seen in the previous picture. 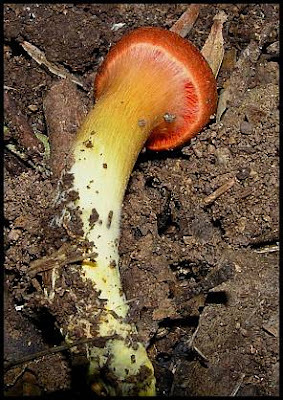 Two distinguishing features are the bright paprika-red gills, and the yellowish base of the brown-red stem and yellow mycelium. The mycelium is a mass of underground filaments (hyphae) which are often visible at the base of the fungus. The yellow mycelium is noticable in the foreground of the next image. A dusting of rust-brown spores can be seen on caps in the following picture. This is a common occurence amongst Cortinariaceae as spores drop from overhanging fungi. The red gills stain brown as the cap ages. Hanging Rock, NSW - Eucalyptus woodland with tussock grass - Jun. Barrington Tops National Park, NSW - Rainforest, in leaf litter - Apr. New England National Park, NSW - Eucalyptus woodland with tussock grass - May. Another interesting post Gaye and most informative, I often seek out info here. I must say that this is a species I've yet to come across but will keep an eye out from now on. Another fine post Gaye, you will have me actively chasing down fungi yet. Thanks. It certainly is a beaut fungus. I have found other Cortinariaceae fungi that I have not yet identified, but this one with its yellow mycelium is easy to identify in the field. If you think you have found it, scrape away leaf litter or grass to find the tell-tale yellow mycelium. re: the flickr fungi site, yes, I wish to share my observations as much as possible, so I will post my pictures where ever I have the opportunity. I'm always very interested to see your fungi from over the west, with such a different habitat to habitat here. Rain here at the moment is looking likely to get the roadside and paddock fungi sprouting, which makes leisurely observation easier for me. Fungi are a vital part of the ecosystem. They are the earth's recycling agents, decomposing dead plant material and returning nutrients to the soil. There is much to be learned about our macro-fungi with many species unstudied. 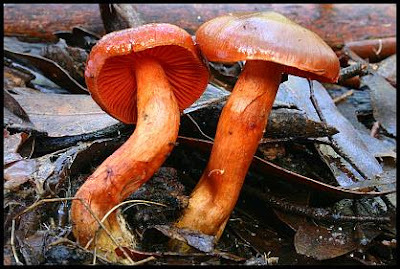 Autumn and early winter is the most productive time in Australia for observing fungi, with a lesser flush in spring. I am not a mycologist, but rather, an enthusiastic amateur sharing my interest in the fascinating world of fungi.